We had three days in Los Angeles and spent a total of 760 USD (or 477.02 SGD each). Singaporeans are eligible for the US visa-waiver programme but we were required to apply for ESTA (14 USD). We applied for ours a month before departure and were approved immediately. 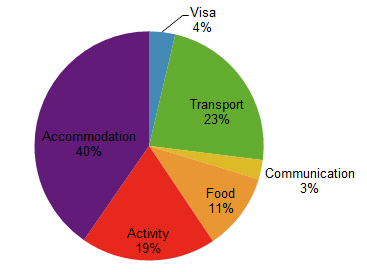 Like in Japan, accommodation was our single biggest expenditure. My friend K got me a really good rate (92 USD/night) at Holiday Inn Express West Los Angeles with breakfast included. Our transport for our time in LA was a Toyota Yaris from Hertz. Rental was 116.80 USD for three days and gas was 31.10 USD. The remainder (27.50 USD) were spent on parking. Breakfast was provided at our accommodation so we only had to spend on lunches and dinners. There were a few meals which we skipped because we weren’t hungry. My friend K also gave us a treat when we met, further lowering our food cost. The most expensive meal was at True Food where we spent around 25 USD each. Warner Brothers VIP Tour (58.50 USD each) and the baseball game between LA Angels and KC Royals (14 USD each) were the only attractions/activities that we had to pay. Most of the places that we went to had no admission fee (Hollywood, Walt Disney Concert Hall, Santa Monica). T-mobile SIM card with three days’ worth of data cost us 20.90 USD. This entry was posted in United States and tagged Summary, USA. Bookmark the permalink.